We use this law very often and it simply means that mass can neither be created nor destroyed. The law of conservation was given by a French Chemist "Antoine Lavoisier". The law also says that, In a chemical reaction, the total mass of the products is equal to the total mas of reactants taking part in the reaction. This law is used in balancing of equations. 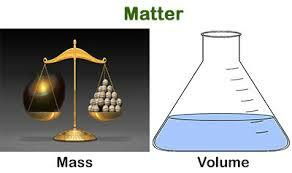 It is the quantity of matter contained in an object. Unlike weight, it's value is contant for an object around the whole universe.